Well, now that I have FINALLY concluded the Vietnam adventure, I am backlogged on what I have been up to since my return. No good, mostly. I won't try to get it all in here since I know that you, the gentle reader, don't want info that's terribly out of date. Good for you! So I'll stick to the notable stuff. 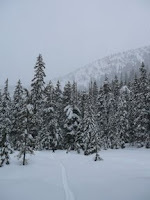 Days after my return home, I got roped into a backcountry ski day with Uncle Ted and Uncle Alex. There had been a pretty good dump the day before, and after checking the avalanche forecast, it was decided go hold a meeting in that bigger conference room, the Cascades. 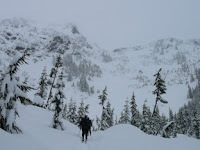 Specifically, Alpental to Source Lake, then up. I have zip for skill or experience when it comes to backcountry skiing, so the learning curve, like the slope, was at times steep. Skinning up is easy. Learning to wax your skins after using lots of energy is a bit tricky. Figuring out how to best swing around with your skis when turning a switchback on a steep slope is hard. Getting to the top only to learn that you didn't use your heel lifters is pure evil. And hey, why can't I go down? Oh, there is still glue on the base from the skins and the snow is sticking to the skis. Where's that wax again? All this said, the snow was insane; knee deep while on skis was not uncommon. Powdery texture we found that day, however, was. Definitely not the norm for the Cascades. It was a good lesson, and I'll give it another go for sure. Thanks, uncles.